The knob allows to adjust the maximum desired indoor humidity level during fall, winter and spring. This control is graduated in relative humidity percentage degrees. 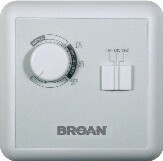 When a higher humidity level is detected, the unit turns on high speed until the situation is corrected.